Regional Cakeathon T: Tunbridge Cakes - Food, Drink, Photography, and other things. 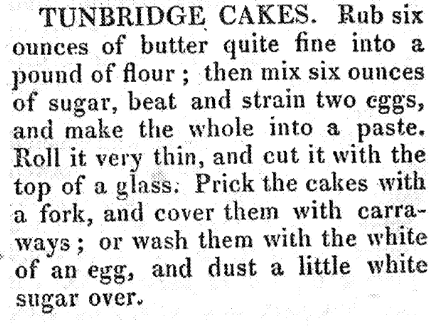 I hadn't realised that Tunbridge (or Tonbridge) Cakes were almost the same as Goosnargh Cakes until this was brought to my attention by Glyn from the Foods of England website. There are several different versions of the recipe around and I decided to try one from a 1822 book called 'The Cook and Housekeeper's Dictionary' by Mary Eaton. This recipe differs from normal shortbread by having eggs in addition to butter, sugar and flour. Rub six ounces of butter quite fine into a pound of flour; then mix six ounces of sugar, beat and strain two eggs, and make the whole into a paste. Roll it very thin, and cut it with the top of a glass. Prick the cakes with a fork, and cover them with carraways; or wash them with the white of an egg and dust a little white sugar over. I followed the recipe fairly closely, keeping the quantites the same. 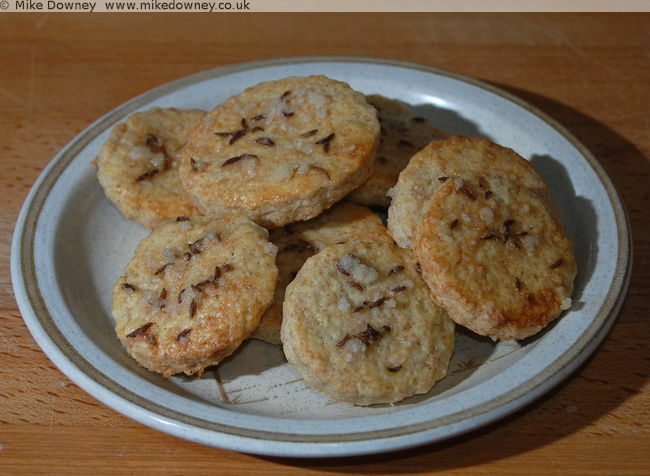 I made some with caraway seeds on top and the rest I sprinkled with caster sugar. I baked them for around 12-15 minutes at gas mark 5. The plain sugared biscuits were good, very similar to a shortbread but not quite as rich and buttery tasting. The ones with caraway seeds tasted too bitter for my liking. They were better after I had scraped most of the seeds off.